Students from the Sato Academy of Mathematics and Science visited fifth graders at 22 elementary schools recently to celebrate National Engineering Week and tackle some hands-on engineering activities. The students designed tin-foil boats, testing them to see which would hold the greatest amount of cargo. They created wind-powered vehicles, checking to see which could travel a set distance the fastest. Other students designed and tested air-powered rockets and hoop gliders. "The day went way beyond our expectations in terms of positive impact on the elementary students, the Sato students and all teachers involved," Sato Principal Mona Merlo said. "Personally, that was my best day in 30 years of being in education." The aim was to recognize the importance of math and science, and their application to problem solving. Key to organizing the visits was Sato teacher Lenny Perez, who recently earned a regional Educator of the Year Award given by the California League of High Schools and California League of Middle Schools. Perez is a master teacher for Project Lead the Way, a leading science, technology, engineering and math curriculum. At Sato, he teaches introduction to engineering design, as well as a course on digital electronics. The Long Beach Unified School District opened Sato Academy as a small high school in the fall of 2015 on the former Hill Classical Middle School campus. Sato is modeled after LBUSD’s nationally recognized California Academy of Mathematics and Science, or CAMS, located on the campus of Cal State Dominguez Hills. CAMS has been recognized for academic excellence by U.S. News and World Report, the Washington Post, USA Today and the U.S. Department of Education, among others. The elementary schools collaborating with Sato on the National Engineering Week activities included Addams, Alvarado, Barton, Burbank, Burcham, Carver, Cleveland, Dooley, Edison, Emerson, Gant, Henry, Kettering, King, Longfellow, Los Cerritos, Madison, Naples, Prisk, Signal Hill, Webster and Willard. 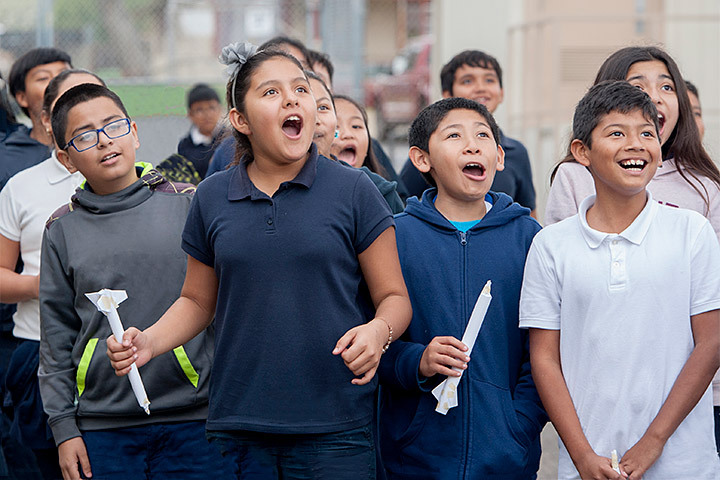 LIFTOFF – Fifth graders at Signal Hill Elementary School marvel at the launch of an air-powered rocket. The students used PVC pipe, soda bottles, and know-how provided by Sato Academy of Mathematics and Science students during National Engineering Week.